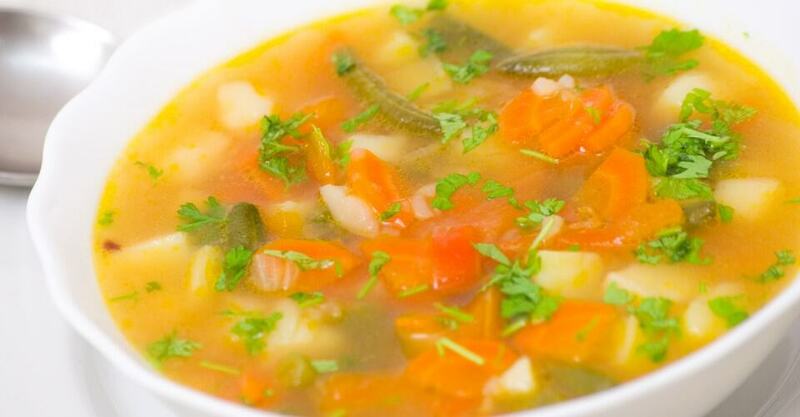 Here are a few healthy soup #recipes by some of the best foodies. Heat the oil in a large soup pot over medium heat. Add the onion and cook, stirring frequently, for 5 minutes, or until soft. Add the garlic, chili powder, cumin and paprika and cook for 1 minute. Add the broth and tomato paste. Raise the heat to high and bring the mixture to a boil. Add the lentils. Reduce the heat to a simmer and cook for 25 minutes, or until the lentils are tender. Add the black beans (both whole and mashed), lime juice, salt and pepper. Cook for 5 minutes, or until heated through. Ladle into bowls and sprinkle with the cilantro. To cook the carrots, bring a medium pot of water to a boil. Add the carrots, reduce heat to a simmer, and cook about 8 minutes until soft. Drain and set aside. Grind the coriander and mustard seeds in a spice mill to fine powder. Heat the oil in a 3-quart saucepan over medium-high heat. (If not using oil, heat a tiny amount of vegetable broth.) Add the ground seeds and curry powder; stir 1 minute. Add the ginger; stir 1 minute. Add the onion and sprinkle with salt and pepper. Sauté until the onion begins to soften, about 3 minutes. Add the cooked carrots and the broth. Bring to a boil. Remove from heat and allow to cool. Puree or mash the soup to desired consistency. Stir in lime juice and zest and season with salt pepper. Garnish with a pinch of garam masala. Chop and steam the cauliflower, then purée in a blender until smooth. Set aside. In a large pot, combine the olive oil, garlic and onion and sauté for 5 minutes. Add the puréed cauliflower, water, clams, milk, potatoes, 2 thyme springs and the bay leaves. Bring the soup to a boil, stir and reduce to a simmer. Cook for 20-30 minutes, until the potatoes are soft and the soup thickens. Garnish each serving with thyme and smoked paprika. Sauté the onions, celery, carrots, thyme and bay leaves in canola oil for about 5-7 minutes, and set aside. Pour the water into a large pot, add the lentils and bring to a boil. Add the tomato sauce and vegetable broth and season with salt and pepper. Blend in the sautéed ingredients and continue to cook down until the lentils are very soft (about 1 hour). Remove the bay leaves before serving. Heat the oil in a large saucepan or stockpot over medium heat. Add the onion, vinegar and 1/4 teaspoon of the salt and sauté until slightly cara¬melized, about 10 minutes. Add the turnips, carrot, parsnip, sweet potato, rosemary, hot pepper sauce, black pepper, cinna-mon, broth and the remaining 1 1/4 teaspoons salt. Increase heat to high and bring to a boil. Reduce heat to medium-low and simmer, uncovered, for 12 minutes. Add the kale and simmer until all the vegetables are tender, about 12 additional min¬utes. Adjust seasoning. Stir the parsley into the soup, ladle into individual bowls and serve.